Drop it like it’s hot, like it’s hot, oh so hot! 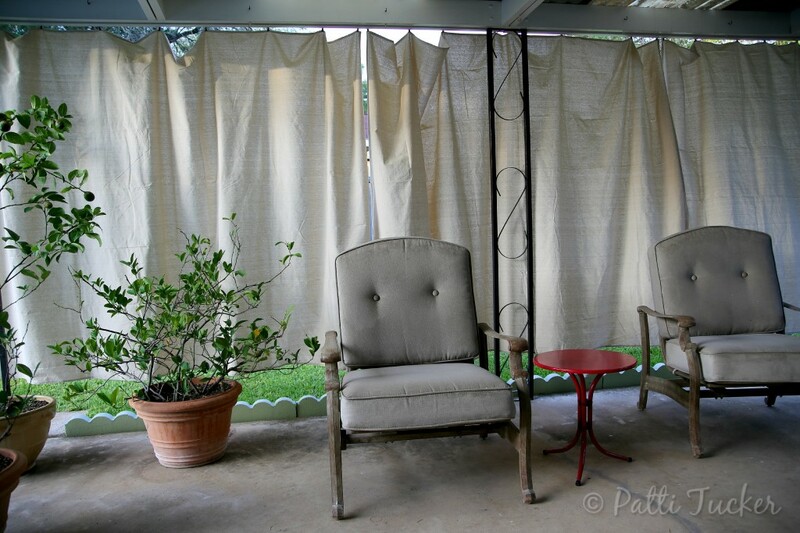 This has been the year of backyard DIY projects (HERE and HERE) one of which I have wanted to do for a few years: Drop Cloth Curtains! A few years back, we had a neighbor whom I nicknamed Cletus. His creep factor from 1-10: 253. Our yard sits a bit below his and he’d stand on his porch and stare into our backyard or worse, our house. I often let him know I didn’t appreciate his creepiness, Texas-style. He got the message. Back then, we installed pull up shades on our porch to block us from him and him from us. The shades where of the plastic variety, made for the outdoors, yet never lasted more than a year or two. 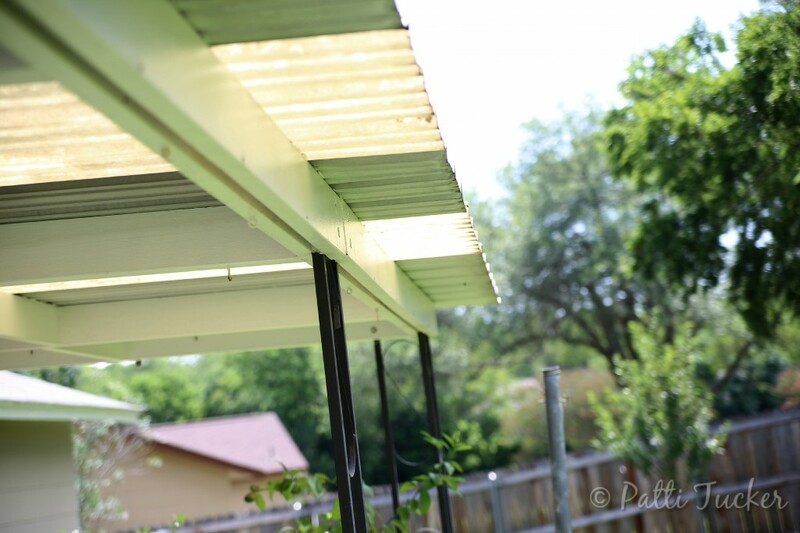 When we took down the shades last winter, I decided ENOUGH! 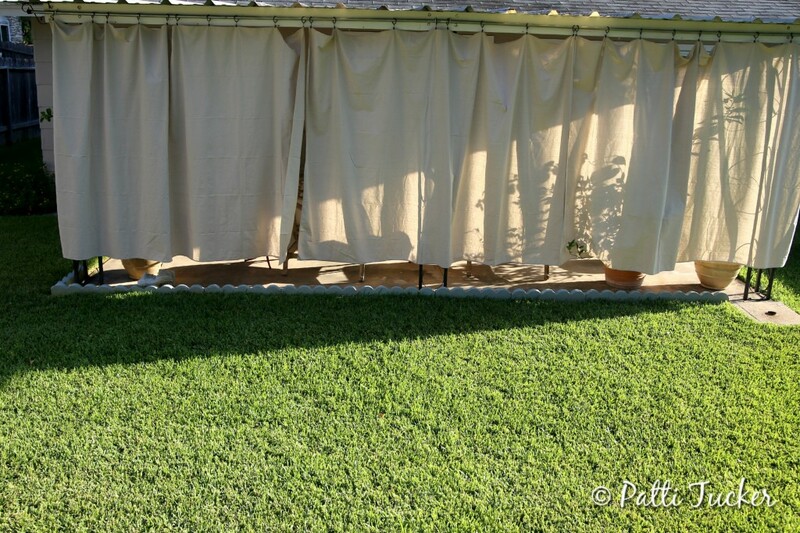 We were gonna get some drop cloths and have us a DIY session, OMT-style, IE the simplest way anyone could ever DIY outdoor curtains. Cletus has since moved (jiggity jig) and a family with itty-bitties has moved in: Oh, happy day! Even though we are happy with the new neighbors (I have no idea how they feel about us), our yard still sits below theirs and well, OMT likes her privacy, y’all. Time for some curtains. 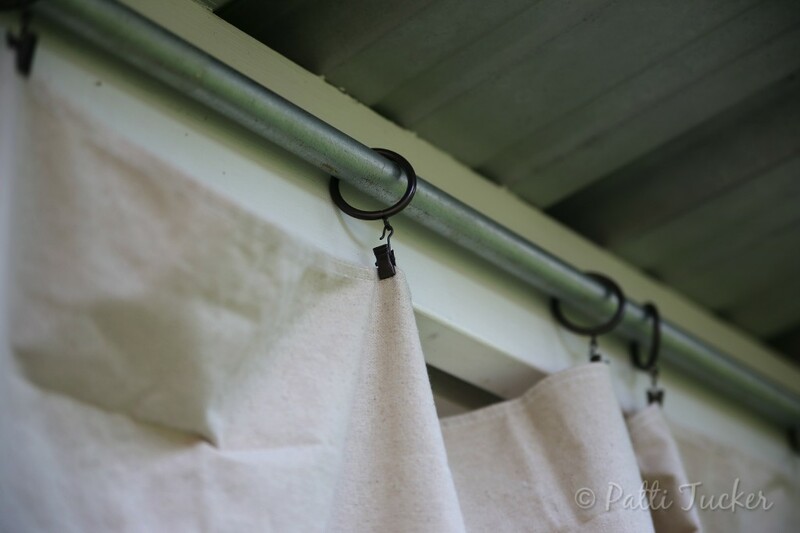 We started with two galvanized pipes as a curtain rod. Considerably cheaper and I like the look. We thought about painting it, but I really dig the raw look. We didn’t get one pipe, but two and used a connector. Easy peasy! Garry did all the measuring and leveling, while I stayed below telling him how good looking he was on a ladder. So good-looking, baby. Truth. 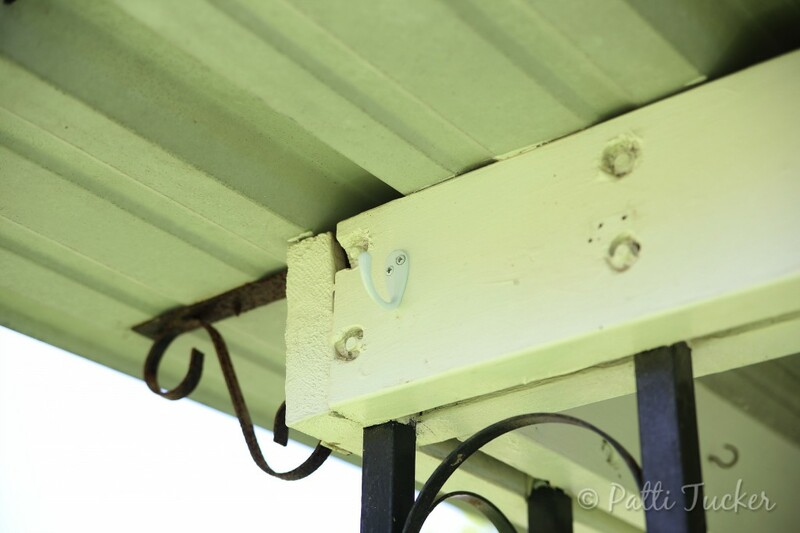 We knew we’d have to install the pole on the outside of the beam, as opposed to underneath because of the metal supports. One thing that we realized after the job was done was that the rings really don’t have the room to just hang and since we don’t want the paint to be worn thin as we open and close the curtains, our solution will be to back each hook with a piece of wood. You won’t see that in the pics, because we only realized it after we “finished” the project. It’s on our to-do and I’ll update this post once we get ‘er done. We got the hooks up, then placed the pole. Bammo! We used three (very similar to these >) 6 x9 drop cloths, because #1) I don’t know how to sew a straight line and knew if we went too long, it would mean one more project that would never ever get done. Turns out I like that the curtains don’t go all the way to the ground. Seeing that bit of grass gives me a summer happy. 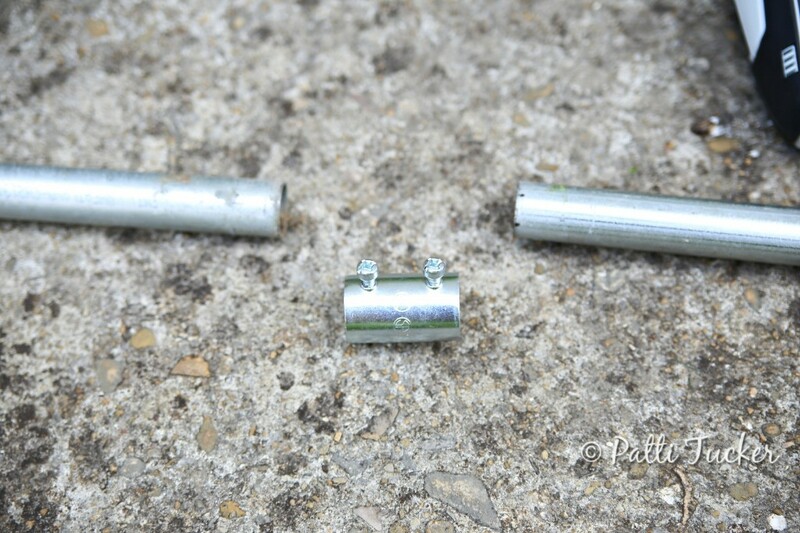 #2) Makes weed-eating easier for Garry. #3) If I’m happy, Garry’s happy, which in this case means everyone is happy! We used simple curtain clips to attach the drop cloths. I’m thinking I’d like to get one more package of the rings to even out the middle section, but overall they work great. Garry thought the heavy duty drop cloths might be too heavy for the clips, but I haven’t witnessed any proof of that, especially since we’ve had a windy rain storm since and those curtains were flapping horizontally, yet remained in place. Cletus would have been so disappointed. We used three drop cloths. One on each end and then one for the middle section. We’ll use tie-backs for all three sections during storms that are particularly brutal. Other than that, the curtains slide open easily enough whenever I need to be seen! Which is like never. STOP LOOKING AT ME! In this pic you can see the slope of our yard. The neighbor’s patio is located behind the middle section. If I had opened that one, you would have been able to see whomever was standing out there on their porch. Here’s our view from the patio when the curtains are closed. Private party, baby! We have bottle service for our VIPs, doncha know. While many of you might fancy-up the drop cloths, I’m loving them as is. We have thought about letting Sweet E walk all over them with painted feet, but other than that, their natural-toned cottony simplicity speaks to my simple heart. 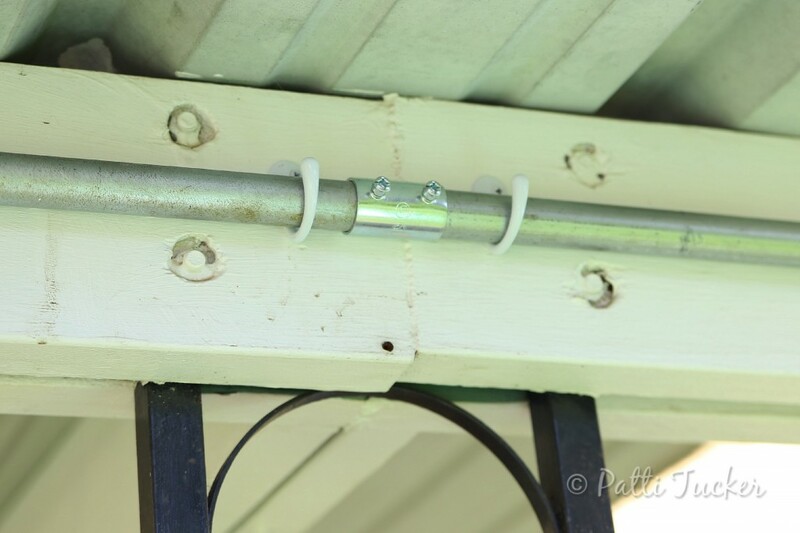 Even though we have a small modification to make in order to let the rings hang freely, it’s a DIY win. Next on our DIY list? One more garden bed. Can’t wait. This looks great!! I’ve been wanting to do the same thing. Thanks for sharing your tips! 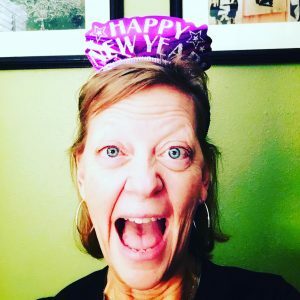 Thank you…now get to it! They look fantastic. I love that it would be relatively easy and inexpensive to replace any drop cloths that ended up damaged and it’s good to hear the clips held strong even in major storms! Bwhahaha! Is it horrible that all my neighbors didn’t even know his Christian name, that they took my cue and called him Cletus? Bad, OMT! I actually thought about shrubs, but dem curtains be working faster! Oh I love this idea – and they look beautiful ! Let me tell you that not ONE day has gone by since I put these badboys up that I haven’t told Garry how in love I am with them. Should have done this years ago. Also, we have one side of the patio that is sans curtains, but gets that searing Texas sun in the late afternoons. We are most likely putting more up. 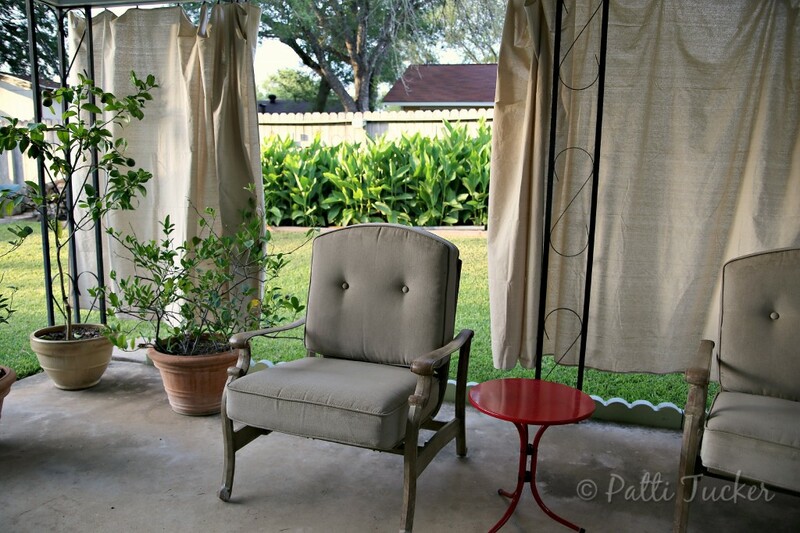 You should totally bite the bullet and get to DIYing you some patio curtains. Luckily I live deep in the woods, so no Cletus for us, BUT that doggone sun just won’t relent! 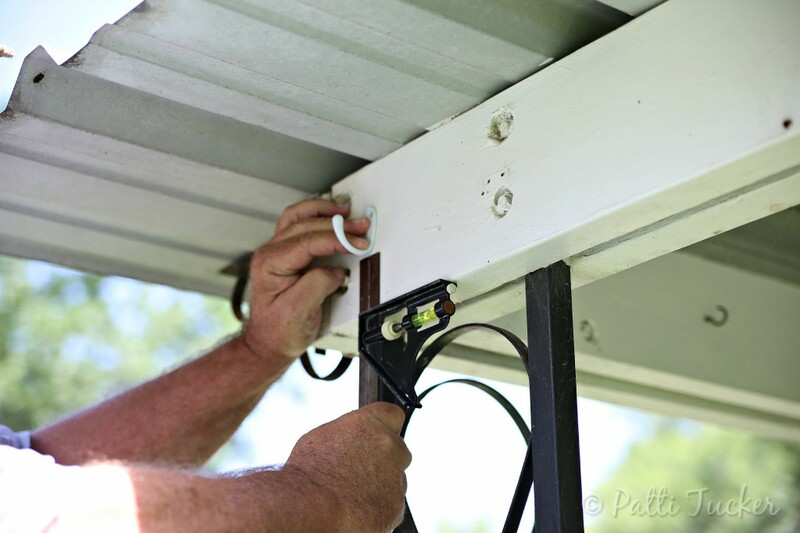 I’m pinning so I can sweet talk my hubby into standing on a ladder for me:) Our back porch needs this! It’s an amazing sun blocker, plus I’m loving that they’re cotton and can be washed. Did the tarps shrink at all? I would wash them in cold water but that isn’t always a guarantee. Also, did you hang them up wet to dry? One more question… do you know what weight of tarp you went with? I want to use mine on a screened in porch. My idea is to keep some of the cold out at night so I can use the porch for overflow when family comes (we live in FL so our visitors are all in the winter) and to close them when it rains so I’m not constantly having to clean. I’m thinking this will work great and am getting ready to get what I need to do this project but have been wondering what weight might work best. I don’t want too heavy in case the clips don’t hold in a rain. Any thoughts you may have would be greatly appreciated! Thank you!!! Hey, Lisa! The drop cloths came in one length and weight. You can check with your home improvement store for those things. It’s still one of our fav projects and everyday I am thankful we made this improvement. I did throw them in the washer and they will shrink some, so keep that in mind. Have fun! I love it. Sometimes privacy is vital. Thanks tons for linking to Inspire Me. I like this easy idea. Does it keep some of the heat out? My back porch in the afternoon gets the heat and I think it heats up my house. I think they look gorgeous as-is. And I imagine on extremely sunny days, this might also take the edge off the heat. I’m a low maintenance kinda gal, so I do like them as-is too. They have offered great relief this summer from the sun, plus the privacy is perfect. This looks great! I always need some extra coverage from the sun during the summer, especially here in Texas. Of all our projects, I love this one the most. Worth doing, especially in Texas! They aren’t too heavy at all. Good luck with yours.